Relatively little is known of the old history of Sweetheart Abbey except that the Maxwells were among its greatest benefactors and that countless Maxwells were among its worshippers for more than three centuries. Many of the stories about the abbey may be lost forever, but it is clear that its history is deeply intertwined with that of the Maxwells. The monastery's first abbot, Henry, oversaw most of the construction, building a magnificent church in the early English style. It measured 203 feet in length with a central tower 92 feet high and boasted a nave with aisles, transepts with chapels on their eastern sides, and a choir without aisles. The monastic buildings were in proportion and were surrounded with a massive granite enclosing wall from eight to ten feet high, portions of which still remain. 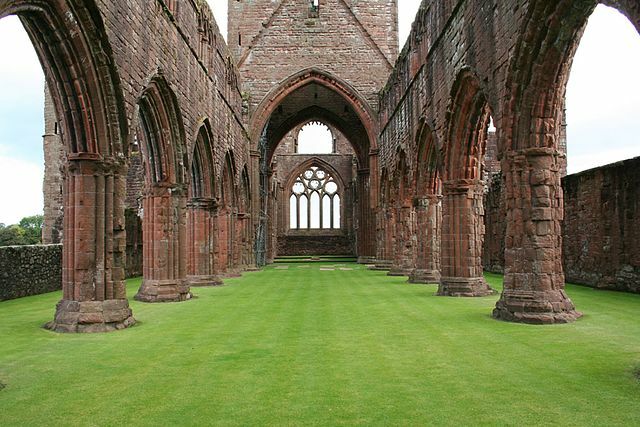 Although it was set in a tranquil part of the country, Sweetheart Abbey was not always the site of tranquil activities, as in 1300 when Edward I of England, Hammer of the Scots, stayed there after sacking the Maxwells' Caerlaverock Castle and invading Galloway. 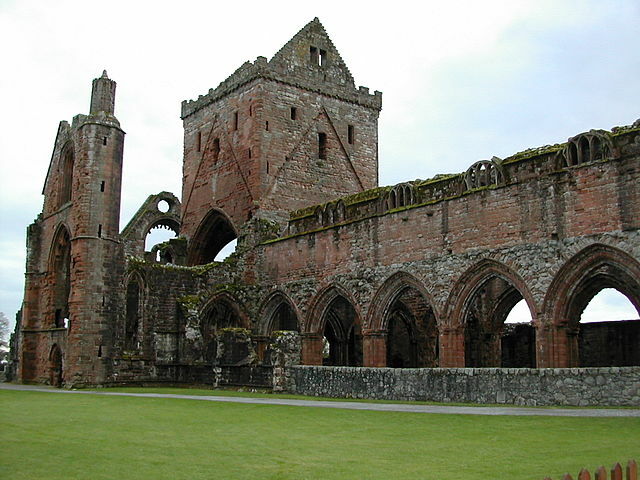 While at Sweetheart Abbey, Edward received word that the Archbishop of Canterbury was awaiting him on the other side of the Solway Firth to deliver a Papal Bull from Pope Boniface IIX. The Pope's epistle called on Edward to cease his oppression of the Scots claimed his own superiority over Scotland on the grounds that the country had been won to the Christian faith by the relics of St Andrew. The King did not consider receiving the bull to be of great urgency and had little desire to see an Archbishop with whom his relations were already strained, so he delayed for more than a month. The Archbishop, who apparently feared capture by the Scots as well as the dangers of the Solway, kept a safe distance until the king returned to Caerlaverock. The Pope's intervention contributed to a truce and Edward's return to England in the fall of 1300. Later, Lady Devorgilla's son, John Balliol, would become king of Scotland at Edward's behest, yet another link to the abbey. Balliol did not rule Scotland for long, however; Edward had his regalia stripped from him when he didn't toe the line. Unlike some of the other abbeys in the Borders, Sweetheart Abbey was relatively unharmed by English invasions, and it continued as a place of worship even through the Reformation. 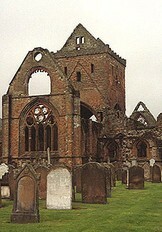 When the Lords of the Congregation ordered that the abbey be destroyed in 1560, the sixth Lord Maxwell refused, saying he was attached to the place "quhair he was maist part brocht up in his youth." The abbey's final years were under the leadership of its most celebrated superior, Abbot Gilbert Broun, who upheld the Catholic faith long after the Reformation and was a powerful opponent of Protestantism. He lived at the Maxwells' Kirkconnel House until 1605 in a structure known as the Abbott's Tower, repeatedly being denounced for enticing to "papistrie, and was seized by his enemies in 1605 in spite of the resistance of the whole countryside. Ultimately, he was banished from Scotland and became rector of the Scots College in Paris. Sweetheart Abbey ceased to be a place of worship for Maxwells and others in 1608, when the last monks were forced to leave. The cloister then became a quarry for those who wanted ready-cut material for building, literally being taken apart stone by stone and eventually losing its roof. Its gradual destruction until the 19th century when some locals acquired the property and stopped its further deterioration. Today the abbey's ruins blend into the beautiful hills of Maxwell country, with a substantial part still standing. Visitors still find the nave, the choir, the bell tower, the stonework of the great east window, and the most complete precinct walls surviving at a Scottish medieval monastery. They also find a reminder of the love story which caused the abbey to be built, an effigy of Lady Devorgilla holding the casket which contained the heart of her beloved husband.